Being an imitator of the great Shepherd. Our Holy Father Theodore was born and raised in Constantinople, and lived during the reign of Emperor Constantine IV Pogonatos (668-685). Due to his great piety and virtue, he was ordained Presbyter of the most holy Great Church of Hagia Sophia. 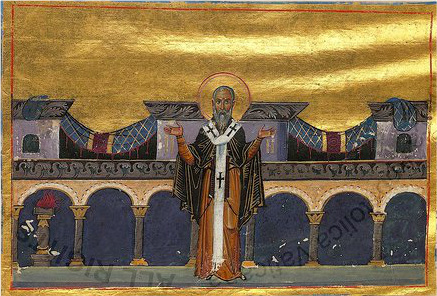 He was then appointed to the positions of synkellos (an advisor and fellow-boarder of the Patriarch, who was usually viewed as his designated successor) and skevophylax (keeper and protector of the sacred liturgical vessels). After the then Patriarch Constantine (675-677) died, Theodore was constrained by the emperor and the entire senate, together with the entire Holy Synod of Bishops, to succeed him. Thus he was ordained Patriarch of Constantinople in 677. Theodore governed the Church in a God-pleasing manner for two years and three months, until he was forced off his throne by the emperor in 679 for being a Monothelite and hindering communion with the Orthodox Pope of Rome. It should be noted that he was a Monothelite in the hopes that he would by this means restore communion with the Monophysites and bring them closer to Orthodoxy. 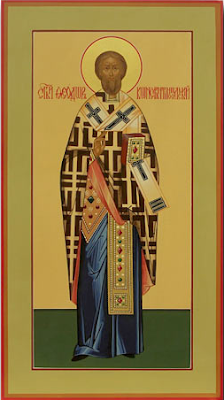 He was replaced as Patriarch by the Orthodox George I (679-686), under whom took place the Sixth Ecumenical Synod in 681 which condemned Monothelitism. Theodore escaped condemnation by rejecting Monothelitism and accepting Orthodoxy. After the death of Emperor Constantine as well as Patriarch George in 685, he requested of the new emperor Justinian II to be restored to the Patriarchal Throne. After the emperor confirmed his Orthodoxy in 686, he was restored as Patriarch and died about a year later in peace in 687.